Bed Bugs after Aprehend has reproduced and killed them. Also known as Bio Pesticides are not a “new thing”. They have been around since the beginning of time. Bio Pesticide is literally using what has been occurring in nature all along. In agriculture, Bio Pesticides have come along way over the last twenty years. Unfortunately, not so much for indoor or what is referred to as structural pest management. The reason for this is because outdoors, Bio-Logical agents can be maintained in a dormant stage for a much longer period of time than what an arid indoor environment can support. Over the years I have run field trials for companies attempting to develop these Biologicals. Most have failed or expired long before the insect pest target could come in contact with their seeds or spores. A new Biological on the market has proven to be unbelievably effective. All while being nontoxic to all mammals. reptiles, birds, and fish. Just to name a few. This product has been knocking the socks off of bed bugs. Best of all, when applied professionally using the specifically designed applicator, the bed bugs practically do all the work after applied. Spectrum Pest Control is proud to be one of the first in the state of Wisconsin and the first in Kenosha and Racine Counties to use this new technology. This Bio-Logical product has been added to our ECO-TECH HYBRID BLEND SERVICE” protocol. The combination of this as well as the latest in steam technology. We are now getting even quicker results. 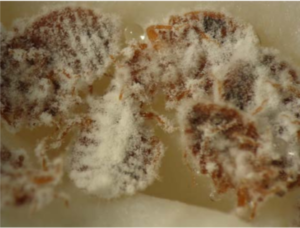 This Bio-Logical is a naturally occurring fungus that attacks the bed bug only. As the spores hatch on the bed bug and grow inside, it allows for the bed bugs propensity to hang out around other bed bugs and spread. This means bed bugs hiding deep in crevices and wall voids will be taken out as well. This product is not legally available for consumer use. In order for it to be effective, it does require specialized equipment and training. It does require the areas treated to be vacated for a full four hours after application. Yes, This product is non-toxic. Once applied you cannot be harmed by the spores or the infected bed bugs. If you recall, I mentioned up until now, bio-logicals have been unsuccessful for indoor control of pest. The reason for this has been how arid our indoor environment is. These seed spores will dry up within hours if not protected in a specialized light oil. This oil is so light, during application, some of it can drift in the air for a couple of hours. WHAT? There will be oily surfaces throughout my home? No. It is a very light oil when airborne, and will fully evaporate in a short time. It should not be breathed in during this short window. Applicators do have to wear a special respirator during application. Not unlike when sanding drywall, painting a car, or installing fiberglass insulation. How soon can I expect success? This all depends on many different variables. Which will be discussed at the time of our initial inspection. Most bed bugs in the area this product is applied will be dead within 3-7 days. This biological does not kill the eggs. We always supplement with steam and other low impact options that will kill many of the eggs. Bites stop within a few days. Again, there are always exceptions. Which are addressed after the initial inspection. ← Why did you do it?